Are you wondering how to save some cash, go green, and cool down? Plant a tree (or two or three)! I read about this awesome tree calculator in Better Homes & Gardens. 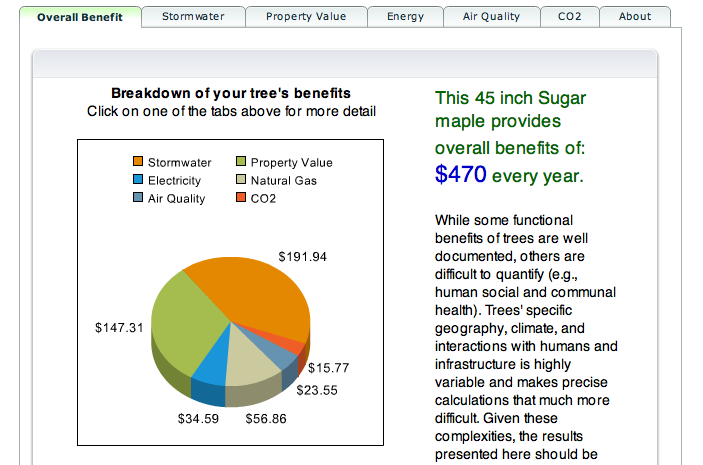 Simply visit the website, enter your zip code, the type of tree you are thinking of planting, and the size of the tree. It will give you a breakdown of that tree’s benefits, an annual cost savings, interception of stormwater, property value increases, energy conservation, air quality benefits, and CO2 reductions. One word, folks: AMAZING! Try it out!